Willie has always been a crooner at heart. Sometimes overtly, with albums such as ‘Stardust’ and his recent Gershwin songbook record; more often simply in his oh so laid back delivery. No surprise really then that he presents us with an album of songs made famous by Frank Sinatra, reinterpreted in fairly faithful fashion (aided by Trigger, used sparingly to solid effect) and, backed by a swing orchestra which nails every note. It’s his 68th studio album! In this scenario, Willie’s at his best when he elects to ditch the ‘bombastic’ endings that Sinatra did so well and focusses on his own natural, more mellow groove. 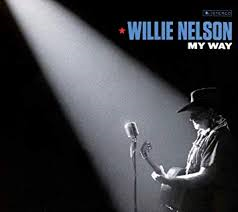 ‘My Way’ stays downbeat throughout, with a harmonica counterpoint to Willie’s reflective vocal. Despite the song itself being a cliché, Willie sidesteps the issue and it’s the best track on here. ‘It Was a Very Good Year’ works similarly – a reflective song in itself, added to which the weight of Willie’s naturally reflective style makes for a really convincing interpretation. The lighter, playful tracks are perfectly enjoyable too though. ‘Fly Me To The Moon’ opens the record and it’s a faithful, fun jazzy, brush snare skip and jump. ‘One For My Baby’ is a little airier than Sinatra’s presentation; the piano’s jazzier in its fills. Willie’s voice isn’t quite as clear as it used to be (the guy’s 85 after all), but a crooner doesn’t really need too much clarity. Irrespective, the record is a lot of fun and Willie doesn’t disappoint us.